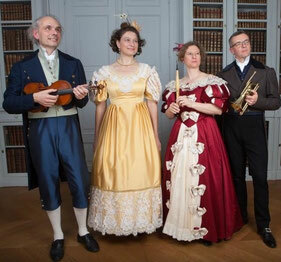 Please be welcome on the website of Les Pantalons, an ensemble which performs 19th Century ballroom and drawing-room music (romances, quadrilles, waltzes and polkas) on period instruments (flageolet, valve cornet and pianoforte). You will find out more about our recitals, the era and the composers. Should you have further questions or should you like to receive additional information, please don't hesitate to leave us an email and we will answer as quickly as possible. Enjoy your visit! the numerous dancing parties and promenade concerts. Les Pantalons would like to bring this ball and drawing-room music back to life with contemporary arrangements for small forces. Light pieces with colourful titles like ‘Les Abeilles’, ‘Le Rataplan’, ‘La somnambule au Bal’ and ‘Le Diable Boiteux’ are performed with great sense of humour and virtuosity and will take the audience on an exploratory expedition to the typical instruments of those times: the flageolet, the valve cornet, the violin and the square piano.